Students learned about drawing and color theory earlier in the year when they each completed a monochromatic self-portrait. 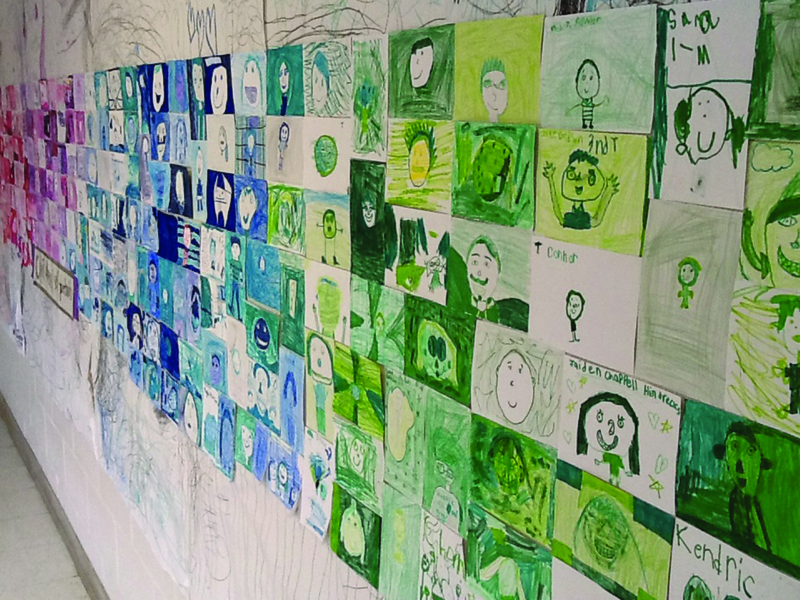 When each class finished, art instructor Laurel Denham placed all portraits in one color family together to create a color wheel. In addition to their regular academic subjects, this semester Jackson Road Elementary (JRE) students have learned about lines and shapes, drawing, and color theory in their new art class taught by Laurel Denham, a University of Georgia graduate who strongly believes in the expressive power of art: “Having art at school allows students to express themselves; often they discover things about themselves or each other through their artwork,” Denham said. This is the first year art has been offered as a “special” at JRE. Though traditionally specials have been music, physical education and technology classes, schools are allowed to go in a different direction, according to Griffin-Spalding County School System Superintendent Curtis Jones. “The schools went in that direction in the past, but we have always had the option for schools not to use technology. Orrs Elementary School went with the science lab. Futral Road decided they wanted to have an art program. It depends on the student and parent to decide which way they want to go. We give them that option every few years to decide on that. It is a partnership between the students, parents and educators,” Jones said. Jackson Road principal Laura Jordan decided to follow the lead of Futral Road, where art has been offered for over 10 years, after receiving feedback from students and parents that they would prefer an art class instead of music. So far this year, students have learned about artists such as Piet Mondrian, Pablo Picasso, and Grandma Moses. They have worked on drawing skills and learned about color, the color wheel, and how to mix colors. Future projects at Jackson Road may include printmaking, sculpture, paper mache, book making, stop motion animation, ceramics, photography and paper making, according to Denham. “I was blessed to be able to visit Futral Road and spend a day with their art teacher, Sara Bachman, and learn from their well-established program. It would be great if more elementary schools had art class – there are so many valuable aspects of making art a regular part of a child’s education,” Denham said. “Working on an art project can be like solving a problem: students are given an assignment and certain elements to include or materials to work with and they must create the solution – with limitless possibilities,” Denham said. For Jordan, the reaction from the students is part of what makes the program at Jackson Road Elementary memorable. “The kids always want to come and show us their artwork or want us to come down to the room and show us what they are doing. They are very proud of what they are creating,” Jordan stated. The future of the program at Jackson Road is a bright one and could possibly pass on to other elementary schools in the Griffin-Spalding County School System, Jones said.